The first time I heard the music of Melodie Stancato I was immediately entranced. Her music felt personal on an almost subconscious level. It’s musical portraiture, trying to capture a sense of place, time, personality, and experience. It’s like finding a stranger’s old journal, or notes left behind in the margins of a used book–a glimpse into the most personal headspace. We haven’t heard a lot from Melodie in a while–it’s been almost two years since the last release from Swoon Lake–but I’m happy to see that in her new single and video for “42.0209° N, 70.0370° W,” the touch of the personal hasn’t been lost. If you google “42.0209° N, 70.0370° W” it will lead you to Truro, MA. Specifically, Hanging Valley on Longnook Beach, which appears to be where the music video was shot. The video is a simple movement piece performed by Stancato in a single take on the side of a sand dune. The song and dance weave a tale of personal exploration and a search for connection. But an internal one, where you analyze yourself within the world and not the world around you. The beauty of this piece lies there, in a reminder to look inwards every now and again, and to let the outside world just be. In the video, Beal’s use of various animated elements allows her to make a visual representation that beautifully compliments the expansive realms of Arc Iris’ music. In a musical universe that feels boundless, Beal chooses to represent constraint. Pattens tesselate, band members are found frozen in time, figures effortlessly glide between designated frames before spinning into fractalized versions of themselves. The whole work seems to be stuck between constant motion and complete stillness–this tension is what gives the video its transfixing power. A surreal dream space showing infinite possibilities even in worlds with restraints. 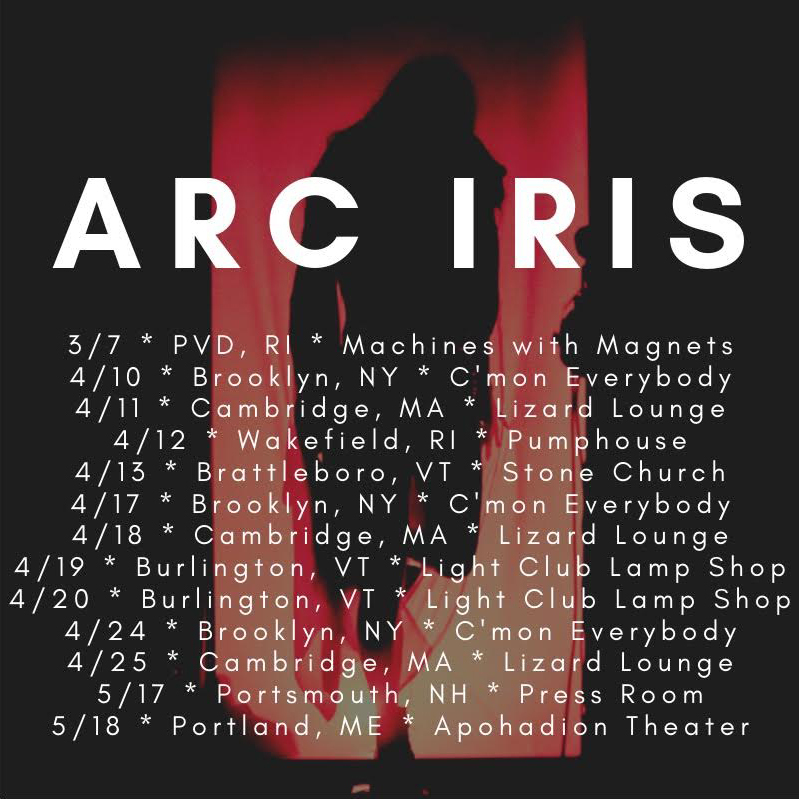 Arc Iris will be starting a tour soon including residencies in Brooklyn, NY at C’mon Everybody and shows in Burlington, VT. Check out full dates down below, and if you are here in Brooklyn with us, be sure to go check them out live. They have consistently produced some of the more memorable shows I’ve seen throughout the years. L.A. based (but Ohio raised) Extra Spooky’s new video for their single “Living Room” is a great example of what can be accomplished with a simple concept and a little creative miniature work. The song, an alliterative assassination of the hyper-capitalistic conditions our current culture provides us, has a sing-songy quality to it. “Having that just getting by fun,” they sing, and it certainly sounds like they are. A particularly great set of opening lines, “The future is stolen silverware / Cut through the irony / Royal hand me downs,” set the stage for the typical suburban living room in the video. Everything is in miniature, and everything looks cheap. But soon the world turns upside down. The “nice” couch starts leaking upwards, then streaming blood. Things fall into the ceiling. “If everything weighed the same would the heavy get lighter. / Or would the light get mightier.” Well everything in this video catches on fire at the end, and a knife stabs through the floor. So it’s not looking great. I’ve been a friend and fan of DC-based musicians Jermey Ray and Andrew Thawley for a while now, and one of my favorite things about their joint project Dove Lady is the way their music floats between absurdity and deep psychoanalytical critique. It’s music which shows that it’s sometimes easier to process the harsh truths of life when you turn them into a joke. Not by emotionally distancing yourself from reality enough to laugh away in a state in ignorant bliss, but rather by embracing the cosmic joke of existence until laughing is the only natural outlet for expressing your feelings. In their new video for “Can’t Be Sad,” Dove Lady teamed up with New York director (and ThrdCoaster) Bucky Illingworth to explore this state, painting an abstract tale of emotional and psychological fracture that warps reality and perception. The video is a rollercoaster of shifting energy and imagery, a controlled chaos which perfectly conveys the torn sense of self explored in the track. What is happiness? What is sadness? What is love? What is hate? Dove Lady’s answer lands in an ambiguous middle ground. You’re not really sure what’s up or down, but somehow that’s ok.
Dove Lady play this Friday (2/15) in Washington DC at Dangerous Pies DC with Bottled Up, Super Natural Psycho, and Clear Channel. Link to the event here. For LIP TALK’s video for her new song “Ad Junkie,” director Ellen Donnelly creatively delves into the surreal and odd ways social media affects our minds. Frontwoman Sarah K. Pedinotti lies in a dreamily-lit bedroom, phone glowing in the palm of her hand. A man with a camera for a face sits next to her watching and, presumably, documenting her behavior. Sarah sings “you are in my head so I take you home / You are in my bed so that I’m not alone.” We’ve rapidly normalized having social media, and by extent the larger world, in our bedrooms. The camera-faced man, the corporate and capitalist structure that take advantage of our psychological weaknesses for profit, joins us in this intimate space. The beautifully rhythmic chorus “And I swallow them up, swallow women and men in a minute” has a hypnotic affect, and we have all been overtaken by this force. With “Ad Junkie,” LIP TALK has crafted a song that’s almost as catchy and addictive as the social media she’s singing about. Check out LIP TALK’s new album D A Y S, available now via Northern Spy Records here!